Posted November 22nd, 2003 by Ms. Jen & filed under news + events. 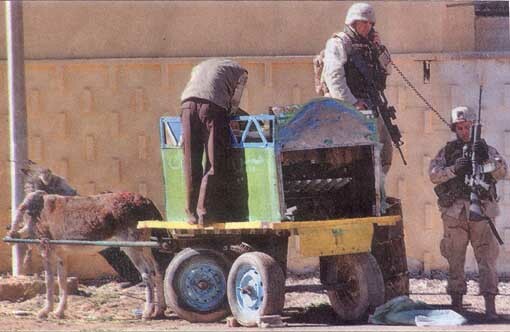 Soldiers examine a rocket launcher mounted on a donkey-drawn cart near the Italian Embassy in Baghdad. Attacks launched from donkey carts Friday again raised the question: Can a high-tech army respond adequately to such low-tech threats? Dear Sirs: I do realized that you all are damned and determined to make a profit in Iraq, but as the last 24 hours of events illustrate David and his Donkey are taking out Goliath and his corporate overlords. As an American taxpayer, I would like us to have adequate and working health care, education, transportation, and utilities right at home here in the good ole USA. Posted November 22nd, 2003 by Ms. Jen & filed under fun stuff. Tomorrow is the Day. Get your Sunday paper. Pluck out the Comic section and toss the rest. Opus est arrive!!!! Posted November 22nd, 2003 by Ms. Jen & filed under tech + web dev. I did it yesterday. Yep, I did. After month’s of thinking about it, after porting Blue completely over in October, today I did it for myself. I left Netscape. After 9 years of Netscaping faithfully through good times and bad, yesterday I downloaded and made Mozilla 1.5 my default browser and mail client. Recently AOL made the decision that Netscape 7.0 would be the last version of Netscape, and yesterday I had some trouble with my email and realized that there would be no updates to solve the problem. Given that Mozilla is a great open software / community development browser, as well as being the core of Netscape’s browser, I decided to not go to the DARK SIDE and instead continue to fight for the Light by making Mozilla my default browser. So far, so good. My only two complaints are both in the mail client: No Spell Check and No File Button of which to use to file emails into folders, it is drag and drop all the way. Posted November 20th, 2003 by Ms. Jen & filed under fun stuff. New Whale? Or new pre-packaged supermarket stocked red meat? Posted November 19th, 2003 by Ms. Jen & filed under nature + environment. Ms. Jen opines: And then they killed them all. You can find the possible new species of baleen whale packaged nicely at the meat counter of your local supermarket. Come on Japan and Norway, stop the whaling under the disguise of “scientific research”! If you want to eat whale and see if as your culinary cultural right, then raise it yourself like beef don’t hunt out of the wild. Posted November 17th, 2003 by Ms. Jen & filed under nature + environment. Coming back from my daily bike ride this afternoon, I saw this liquid amber tree a block away from my house. 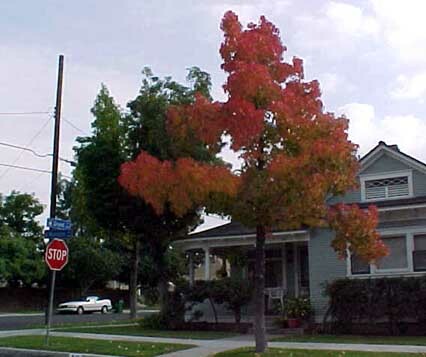 Many of the native California sycamores have been turning brown and losing leaves for a couple of months, but this week the non-native maples and liquid ambers have been turning shades of yellow and red. Posted November 15th, 2003 by Ms. Jen & filed under art + photography. 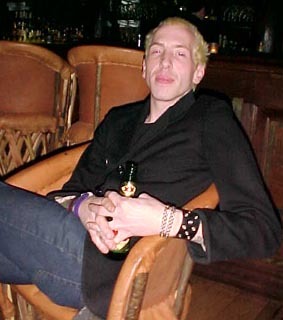 Feb. 4, 2003 : I interviewed One Man Army’s Heiko Schrepel for Kart Sport Magazine before the band’s sold out show at the Troubadour. This photo was taken after the interview was completed but before we returned to the Troubadour. Congratulations to Dave & Lora! Posted November 12th, 2003 by Ms. Jen & filed under news + events. I would like to extend a hearty congratulations to Dave “The Chairman” Mau and Lora “Lindy Lora” Wilson. Yesterday was their thrid year anniversary. Three years ago, I threw a benefit party for Scarlett who was going to study in Ireland and needed to raise some money to pay for rent while she was gone. I hired Dave to make his famed MauBBQ, and Lora asked me for an introduction to Dave. And off they went. Lora returned to California today after a one year career related absence and Dave threw a welcome home dinner party. Here they are three years later. Yeah! I have hope.